Aeromedical medicine has made significant advances over the past decade or so in terms of intensive care equipment and training and the kind of medical procedures that can be performed in flight. Today, an air ambulance service has most of the capabilities of an intensive care unit, allowing the flight crew to transport critically ill patients in a way that was not possible 15 years ago. The training of the air ambulance service flight crew is probably one of the most important factors for the success of the mission. It’s not enough to be a good doctor or nurse or even a very skilled paramedic as aeromedicine requires specific training and skill sets. Aeromedical transport courses are mandatory for all medical crews in order for them to understand the real impact of altitude, cabin pressure, vibration, noise, dehydration and other in-flight conditions on the patient’s hemodynamic stability. To highlight the specific factors at play in aeromedicine, it’s instructive to think about how we feel on a regular commercial flight as healthy passengers. It’s normal on any flight that is more than three hours for healthy passengers to get dehydrated, experience swelling of the feet, feel drowsy, to swallow often and also to frequent the bathroom more often. These conditions can have a more serious impact on a sick patient with critical medical complications. What might be temporary discomfort for us, may have lasting effects on an air ambulance patient. However, today, with state-of-the-art equipment fitted in the Medilink MIAA Air Ambulance Service and with highly-trained aeromedical flight crew patient transfers can be carried out safely and with improved patient outcomes. It’s difficult to be prepared for all eventualities that may arise during an air ambulance evacuation which is why it is imperative that clinical governance procedures are adhered to throughout – from aeromedical training and equipment to careful planning of any mission, and a full clinical assessment and the correct packing of the patient prior to the flight. These procedures and attention to detail will reduce the risk of unexpected or critical situations occurring at 35,000 feet in a confined space with limited light. 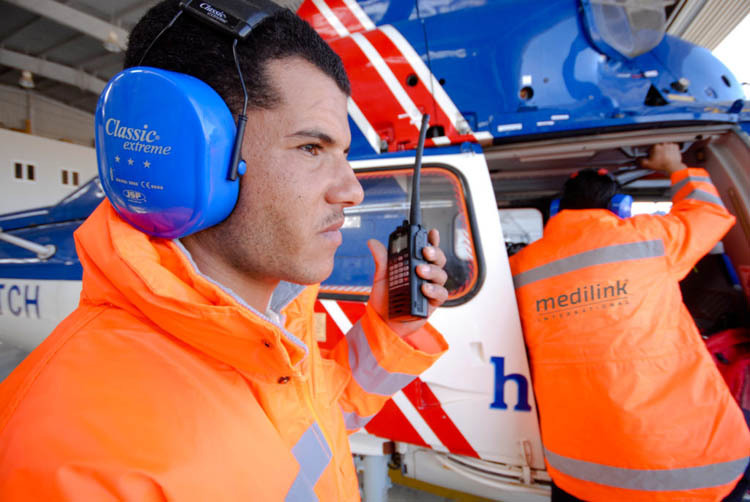 To coordinate any air ambulance request, Medilink’s Alarm Centre based in Malta is staffed round the clock with consultant doctors (emergency physicians or anaesthesiologists with aeromedical training) to assist the crew in carrying out all five phases of a medevac successfully: Activation, Mobilisation Medevac, Hand-over, and Post-flight review. Throughout the transfer, the medical team is in constant communication with our Alarm Centre from where our Topside Support doctors provide constant support and advice. Medevac is a very complex process and must be taken very serious. More than 18 people are involved in each air ambulance flight mission; they include Alarm Centre operators, flight engineers, pilots, ops managers, topside support doctors, as well as ambulance crews on departure and on arrival. Medilink has invested heavily in ensuring it has robust systems and expertise in place to ensure that however atypical any aeromedical evacuation, the situation is handled smoothly as routine. Lives depend on it, and we are fully dedicated to ensuring this arm of our operations provides total reassurance to our clients and their staff.